As a USAT Level 1 Certified Coach for the past nine years, I’ve coached 100+ of athletes to the triathlon finish line. As an experienced endurance athlete, two-time Ironman triathlete, ultra distance trail runner and marathoner, I believe that training for sports in an analogy for life. The skills that you develop through training can help you to perform better in all aspects of your life. I work with athletes of all ages who are new to running or triathlon, or who are taking on a new distance. The training meets you wherever you are currently, and gradually progresses as you do. My training programs take a holistic approach, taking in to consideration the athlete’s goals, as well as current level of fitness, prior experience, lifestyle, and outside commitments, to create a perfect fit. I’m accessible to my athletes, whether it’s to listen and provide feedback, or boost their motivation with a pep talk. As a USAT Level 1 Certified Coach for the past nine years, I’ve coached 100+ of athletes to the triathlon finish line. As an experienced endurance athlete, two-time Ironman triathlete, ultra distance trail runner and marathoner, I believe that training for sports in an analogy for life. The skills that you develop through training can help you to perform better in all aspects of your life. I'd love to connect with you to learn more about your experience, your goals, and how I can support you. Meet those who Live Well and Train Well. I am nothing without my clients and I relish the time that we have together. I am as invested in their successes as they are and I love being part of the change. "Thanks to Jean I completed my first ever triathlon! She was so good about making a training plan that worked around my schedule. She answered all my questions and really put my mind at ease. Using a coach to train for my first tri was definitely the way to go! 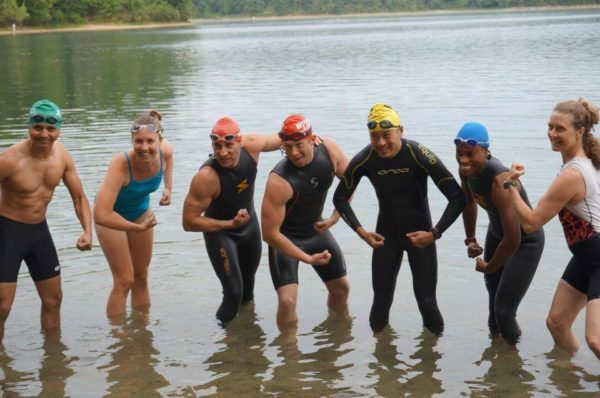 I am now hooked on triathlons and can't wait to use Jean as coach again!" "I'm loving your [Total Fitness] class. Thanks for working so hard to bring us such awesome classes. You're helping me turn into an 'ex' couch potato. You do such a great job keeping an upbeat vibe....I'm finding I like the workout - this is a minor miracle and you should give yourself a ton of credit for that! Thanks for all you're doing - it makes a difference!"